The Canadian Milking Shorthorn Society congratulates long time member Keith Barrett on his recent induction to the Atlantic Agricultural Hall of Fame on October 19th in Truro, Nova Scotia. Keith was the 2017 inductee from Prince Edward Island, and was nominated by the Dairy Farmers of Prince Edward Island. Keith founded his Oceanbrae herd of Milking Shorthorns in 1950, building one of the most successful Milking Shorthorns in Canada since then. Keith is a past President of the CMSS as well as the Canadian Shorthorn Association. 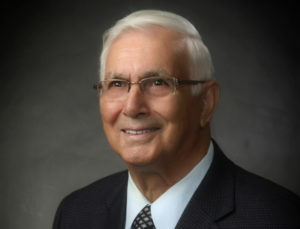 He was honoured as with the Society’s Distinguished Service Award in 2010 and is an Honourary Life Member of the CMSS. His Oceanbrae herd was awarded Master Breeder recognition in 2008. Keith has also traveled extensively, visiting Shorthorn herds in the United Kingdom, United States, and Australia. He was instrumental in bringing outcross genetics from both the UK and USA to Canada for the benefit of his herd and others. Keith continues to be involved in farm, assisting son Fred and grandson Matthew at busy times of year with their Milking Shorthorn and Jersey dairy herd as well as a cow-calf herd of primarily purebred Simmental beef cattle. In addition to his accomplishments with the Milking Shorthorn breed, Keith was also lauded for his contributions to Prince Edward Island agriculture through involvement with local boards and projects, including crop insurance, helping to establish the first community pastures on PEI in his community, milk marketing boards, and the national Farm Credit board. He has also continued to be active in his local community and church for many years. Mr. Barrett’s full citation can be viewed at https://www.dal.ca/diff/aahf/inductees/keith-barrett.html. Congratulations once again to Keith on his contributions to both the Milking Shorthorn breed as well as to agriculture in Prince Edward Island.